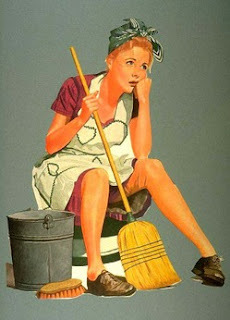 There has been a lot of talk about getting housework done in the communities I visit lately. #1 – I would say GET OFF THE COMPUTER! Okay I am obviously just kidding because I spend way too much time online and I would hate it if my readers spent less time online and did not have time to read me. Most of you know that I have the lazy approach to almost everything. Ironically, I work hard at finding the lazy way to do things. I make laziness an art form. So what would you expect from me other than a lazy approach to housework? All moms struggle with how to have time for kids and housework. I love spending time with my kids and hate housework. No child will grow up and look back at their childhood and say, “Mom always had a spotless house”. They will however remember how much fun you had together. When my girls were little I had a strategy. I made a point to stop what I was doing every hour and get a quick chore done. I also never cleaned anything that would get dirty again through the day. Then 30 minutes before James would get home I would race through the house putting things in baskets and cleaning. I still have baskets. It is like filing toys and clutter. I file things away in baskets according to what room they should be in and put them in that room. Now that my kids are older we even have a clean laundry basket for each child. I separate laundry into the baskets and when the kids get home from school they have their own baskets of laundry to put away. *To read more about our family chore lists check out our Daily Chores post. *Also make sure to enter our Current Giveaways. Well , I don't take that like a joke but it is really true that setting online takes much of my time away . maybe if a made a schedule and stick to it I can mange some time for housework and fun in the same time , right ?! Def. think it helps to do small things throughout the day, instead of it all at once wasting a big chunk of time you could be spending with your kids. And had LOL – I too do the quick clean-up 30 minutes before hubby walks through the door, at least looks like the house is spotless for a little. There is a some truth in the get off the computer comment. But, the stopping once an hour to do one quick chore is a good idea.